This article was co-written by Ernest Jones and Galen Herbst de Cortina. Galen: So, the new tax bill passed. Remember when it was supposed to simplify the tax code? Theoretically, I should be happy since it’s pretty good job security to mess with what people know about taxes. Theoretically. It included plenty of changes for everyone. 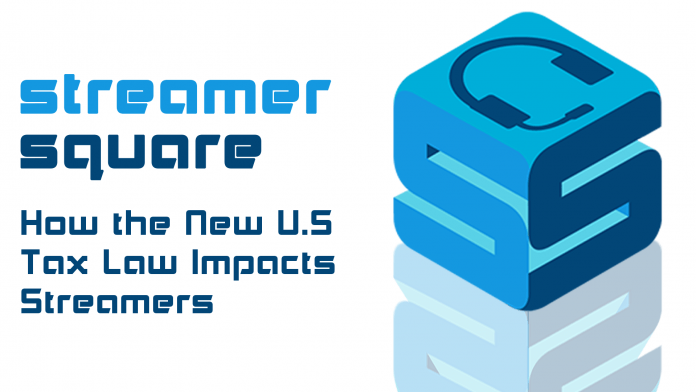 There are some things that dramatically impact streamers and small business owners more than most. We’ll cover the top 7 changes but there are a lot more than what we cover here. If you have questions on any of this, check out my contact info at the bottom of the article. Ernest: One thing that I always end up telling people is that your own individual facts and circumstances will determine your tax position. With the changes in the law, this is even truer now. Your own unique situation will determine if this law will be an increase or decrease in your tax bill. The important thing is get informed on how the law has changed and impacts you because most of the changes apply to the calendar year 2018. The individual mandate for health insurance is gone starting in 2019. This means that you’ll still need to have health insurance coverage in 2018 or face a penalty. This does NOT mean that the Affordable Care Act is completely undone. If you have questions on health insurance for streamers read up here. Overall, it’s still a REALLY GOOD idea to have health insurance if you’re in the US. After all, healthcare costs are the leading cause of bankruptcy in the US. This is especially true for full-time streamers. Unless you have access to health insurance from a spouse or a parent, you’ll have to take some time to figure it out. 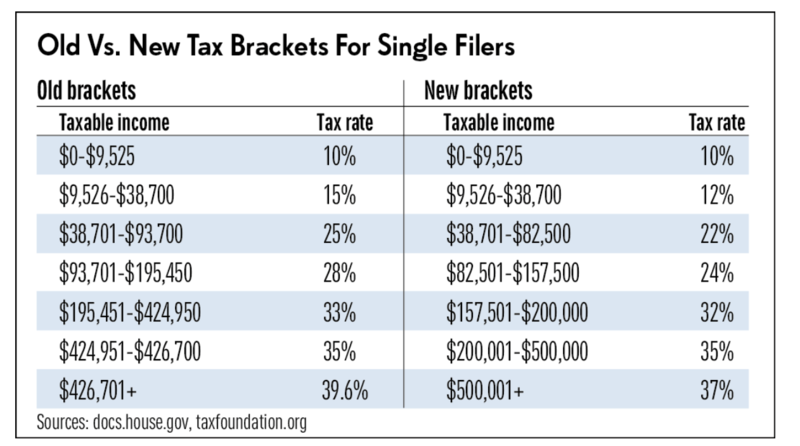 The new law changes the tax brackets. For most people, it will be a decrease in their tax rate. As of now, these lowered rates expire December 31st, 2025. There’s not much else to say on this. Images below are from Investors.com. Remember, these are income tax rates. As a streamer, you still owe self-employment taxes! There were many changes to deductions and exemptions in the new tax plan. Without knowing your specific situation, it can be hard to know the net effect on you. I’d recommend taking a peek at your tax form 1040 from 2017 to do a comparison. 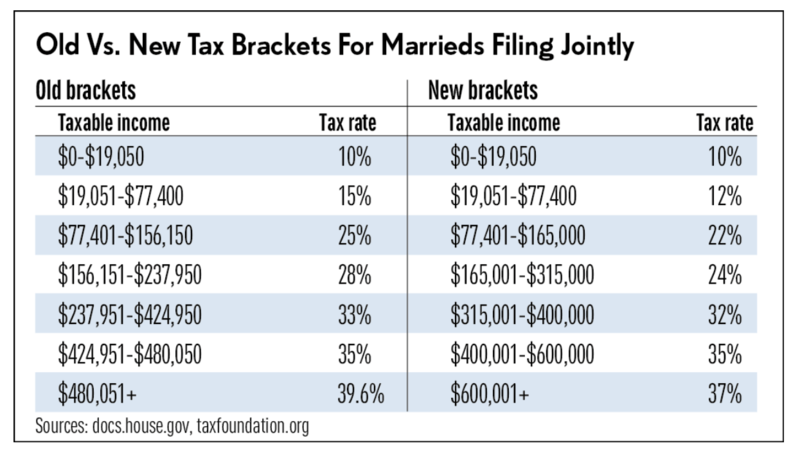 The standard deduction was nearly doubled from $6,350 single ($12,700 married) to $12,000 ($24,000). This means that if you didn’t itemize your deductions before you may save money as you have a bigger deduction. If you previously itemized deductions you may no longer need to. This is especially true with the SALT cap we’ll discuss below. The reason I said you may save money with the doubling of the standard deduction is partially because of the elimination of personal exemptions. Previously, you got $4,050 per family member. If you’re single or a married couple with no kids then the loss of the exemption is a smaller effect than double the standard deduction. However, if you had more members in your family then the previous total of standard deduction and personal exemptions could be more than the new standard deduction. For instance, a family of 3 used to get a $12,700 standard deduction and $12,150 in personal exemptions for a total of $24,850. Now they only get $24,000. The above issue is somewhat (and potentially entirely) offset by the bigger child tax credit. Previously families got a tax credit (credits are better than deductions!) of $1,000 per child. Now you get $2,000 per child. Therefore, the family of 3 in the previous example could have more to pay in taxes because of fewer deductions, but that tax would be reduced by $1,000 which likely adds up to more than the increase. Additionally, 70% of the credit is “refundable”. That means if it reduces your tax bill below $0 you actually get money back from the government. SALT stands for State and Local Taxes. In practice, this means state income tax and property taxes. While many places in the country will likely feel no effect from this, if you’re in a state with high income taxes then you may take a hit. The new law caps the total you can deduct for state and local taxes to $10,000. This is an area where looking at last year’s 1040 can give you a TON of insight. Specifically, I’ve seen this impact California and New York the most amongst my clients. That’s because of the double whammy of high income taxes and high property prices. The home office deduction didn’t change for streamers! It was removed for work from home employees but not for business owners. If you’re a streamer earning any money from streaming you could be considered a business owner so you should be in the clear. Galen: This section is pretty complex and for that I apologize, though only a little. After all, it’s not my fault but that of a Congress that basically wrote the bill five minutes before voting on it. One really important fact about this section is that it deals with “pass-through entities and income”. Check out this article for a longer discussion on pass-through entities. The TL;DR is that some types of businesses (partnerships, sole proprietorships, S-corporations, LLC’s taxes as S-corporations) don’t get taxed at the business level. Instead, the business net revenue is “passed through” to the individuals who own the company. This is unlike a C-corporation where the business is taxed and then the owners are taxed again. So what is the QBI deduction? It’s a new deduction introduced by the tax law. Now, taxpayers who receive pass-through entities functionally pay 20% less tax on their Qualified Business Income. For example, say you earned $50k of QBI as a single filer. For the sake of this example, say all of that money was taxed at 22%. That means you’d owe $11k in taxes. If this were wage (W-2) income that would be the end of the story. However, since it’s QBI you actually pay 20% less tax meaning you only pay $8.8k (80% of $11k). Ok, what counts as QBI? It is business income that isn’t investment income or “reasonable” compensation to owner/employees. This potentially limits how much value you can get from this deduction as a streamer. After all, most of the value in your business derives from your labor. It’s possible that anywhere from all to a small percent of your streaming income counts as QBI. Talk with your CPA to set this level if you’re incorporating or looking to incorporate! The issue here is that since streaming is a newer industry and so many people earn so little that it is hard to set what is “reasonable”. There are some intricacies of business entity and how it interacts with QBI. That would take an entire article to cover so just know that it has an impact. If you’re looking at how to organize your business from a tax and legal perspective TALK WITH AN EXPERT! Yes, I said it twice in two paragraphs. It’s that important. Additionally, there’s a phase-out on this deduction if you’re in certain lines of business. Streamers are subject to the phase-out, unfortunately. Basically, if you’re making over $157,500 single or $315,000 as a married couple you lose that deduction slowly over the next $50,000 ($100,000) of income. Not only does it phase out here but it’s then limited to the lesser of 20% of your business income or 50% of what you pay employees in W-2 wages. Almost no streamers hire someone and pay them W-2 so that’s a major barrier… if you’re earning a lot though. One note: this is a below the line deduction, meaning that it reduces your taxable income, not your Adjusted Gross Income (AGI). This is important because below the line deductions are less beneficial than above the line deductions (which reduce AGI). However, it is not an itemized deduction so if you qualify you could claim it regardless of if you itemize. Ernest: This change is one of the most complicated changes in the new law. The reason it exists is to try to bring the business income tax rates for pass-through entities more in line with the revised C Corporation tax rate of 21%. Because of the complex nature of this deduction, knowing the exact way it will work will depend on the how the IRS implements the law. As of this writing, the key thing to note that is if your taxable income is below those thresholds listed above then you are likely eligible for a deduction that will reduce your taxable income and consequently your tax bill. Ernest: So, as the tax guy, I’m going to run through some very rudimentary examples of how the tax law will change the resulting tax bill. As stated previously, your own individual circumstances will determine the outcome. Accordingly, I am not going to be factoring in itemized deductions and presuming that the standard deduction will be taken. Also, keep in mind this doesn’t factor any kind of tax structuring that may aid in reducing your tax liability. Nor do I factor in any withholding from W-2s as that again will depend on your individual circumstances. This merely serves as determining how much tax you will have to pay in some way. The scenarios will likely not be a perfect comparison to your situation and is an estimate for the scenarios detailed below. However, hopefully it will provide some insight as to how the tax law will impact you. Keep in mind this calculates how your tax liability will change and not any potential refund or amount owed as that is determined by withholding and estimated payments (if any). If you’d like to dive deeper into figuring out how the tax bill will impact your situation, the tax policy center has put together a very good tool to do so. You can check that out here. Galen: There are a ton of changes and it’s hard to know their total effect on you. I would suggest grabbing a glass of wine (or drink of choice) and your 2017 form 1040. Then, browse over it and do some math on what will change for you. After all, the more you know and can anticipate now the better your decisions will be in 2018 and beyond. More than likely, your best bet is to work with someone who does this for a living. It’s complex and it’s hard to know what you don’t know! You don’t have to figure this out alone. This is what we do- help streamers and young professionals make great money decisions. If that’s something that sounds interesting to you reach out me or schedule some time for a free consult. You can check out what I do here. Ernest: You can find out what I do here and reach out to me as well. You can also various tax topic articles here. More to come soon.